This is a time lapse video [see below] that demonstrates my approach to making and how the act of making allows me to connect and interact with others. My making process is generally inspired by textile processes but in order to engage with a wide audience and invite participation I like to use more accessible materials that are non-intimidating to people who have no experience of traditional textiles. I have just completed an MA in Design (Contemporary Craft) at Manchester School of Art. Through the MA I have developed a participatory practice and have explored how making manifests itself in my work. You could say it has been a slight obsession! I have struggled with a personal need or desire to make things but have no particular refined craft skill. Despite this, I do make, but the making is always focused on the process and not on producing an object or finished product. 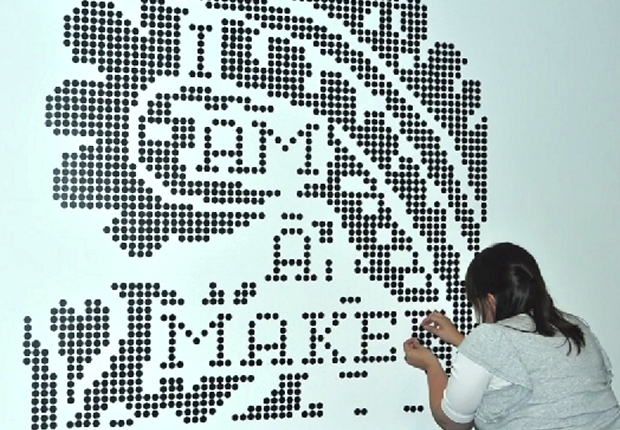 In ‘I am a maker’ I set out to prove to myself that that is in fact what I am. Thank you to Gemma for sending this in. Next you might like to look at other items in the series.